Tomorrow is 1st of October – and therefore the first day of Inktober! If you haven’t heard of it yet, I’ll explain what it is: Essentially it is a drawing challenge created in 2009 by Jake Parker – click here for his introduction to Inktober. This year is the seventh year of Inktober and again many people from all over the world are going to participate. Every day during the month of October you create an ink drawing. You may do a pencil sketch first and you may also colour your drawing – or keep it black&white by using (cross-)hatching, stippling, etc. You then post it on your blog, on Instagram, whereever you want it. You mark it with the hashtag #inktober. That’s it! It was only today that I heard about the challenge for the first time and I really like it! You create a good habit of drawing regularly (which is necessary if I want to keep blogging here 😀 ) and you are bound to learn a lot. Well… I’ll accept the challenge and post as regularly as I possibly can, let’s see how far I’ll get! I also might be posting WIPs (works in progress). And I might batch post the drawings since I might not have time each day to draw AND write a post. 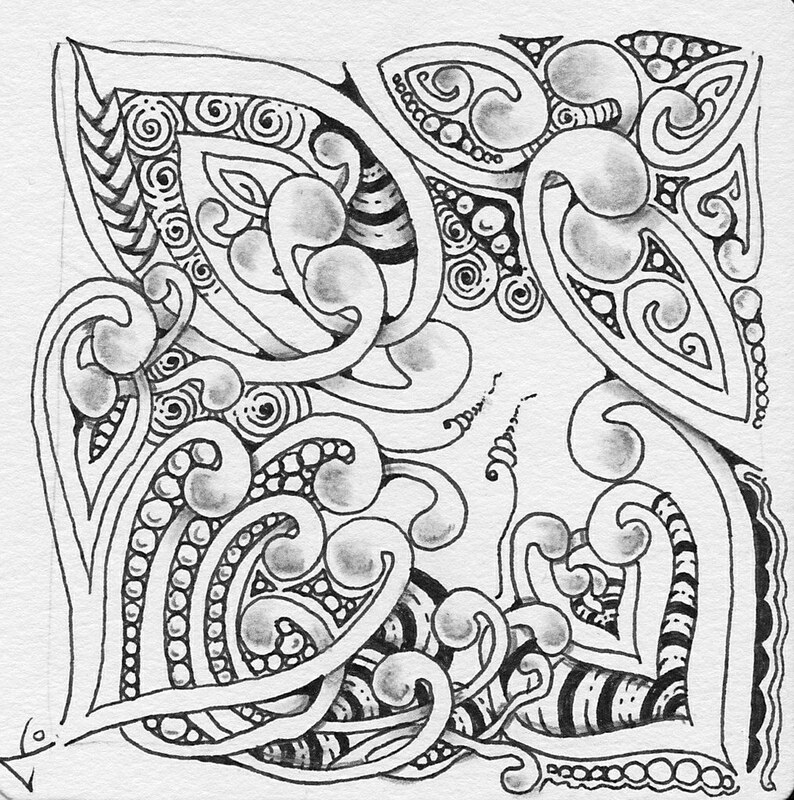 Of course, contributions to the Diva Challenge or my posts about the One Zentangle a Day challenge do count in, too. Another thing I hope for is that the challenge will help me to make space in my paper drawer. Right now it is actually bursting from all the sketch blocks and watercolour paper I own… and I want to buy new paper all the time! So let’s make way for some new paper by using it regularly for a change. And a few very nice articles on Inktober 2014 by The Telegraph and Paste Magazine. 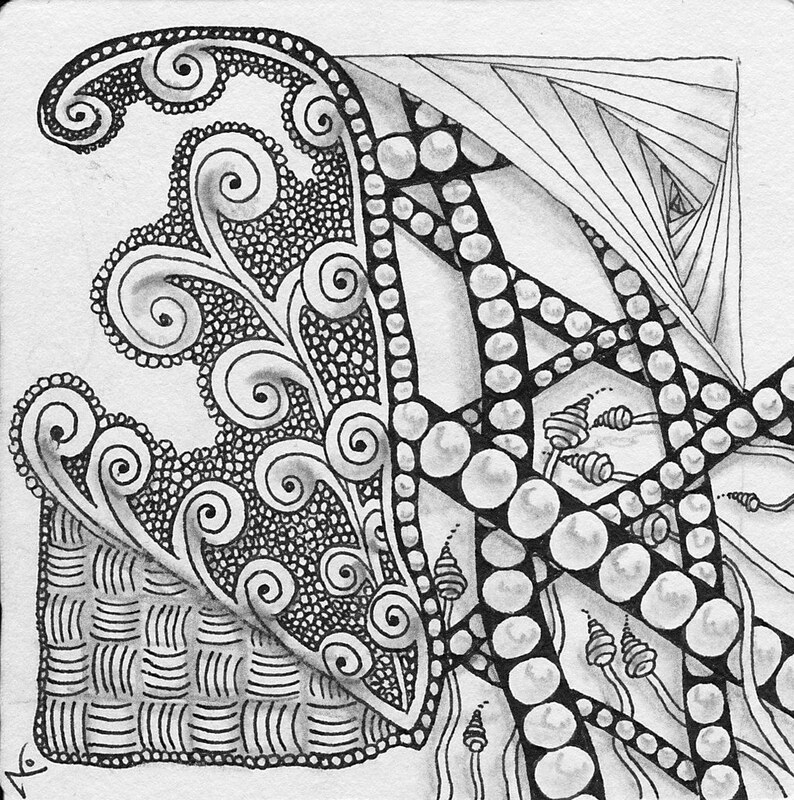 “One Zentangle a Day” by Beckah Krahula was my first Zentangle book and I already own it for quite a few years. However, I’m embarrassed to admit that I never came to really work through the book because the rhythm of 1 tile per day is just way too fast for me. This makes me a little sad, since it is a great book (I’ll write a review as I go along or after I finish this project). Now that I have this blog I decided to give it another try. No day shall be skipped (even though I already know that the “white on black”-challenge will be very hard vor me..) and no excuses are allowed here. There was no string given so I made my own which resembles the letter “p”. 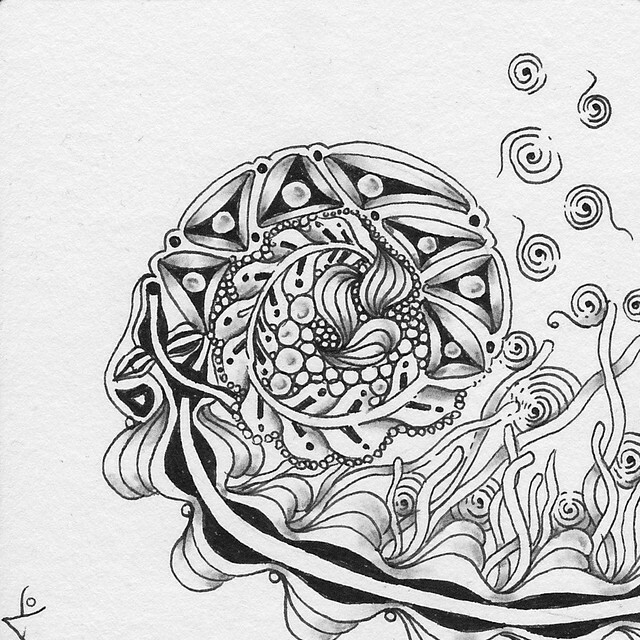 Recently I discovered that tiles and Zentangle-inspired artwork where one tangle transits into another appeal more to me and that the reason why I didn’t like my own work sometimes was that I totally lacked this aspect. There was no flow between the tangles, just stop&go, if you know what I mean. 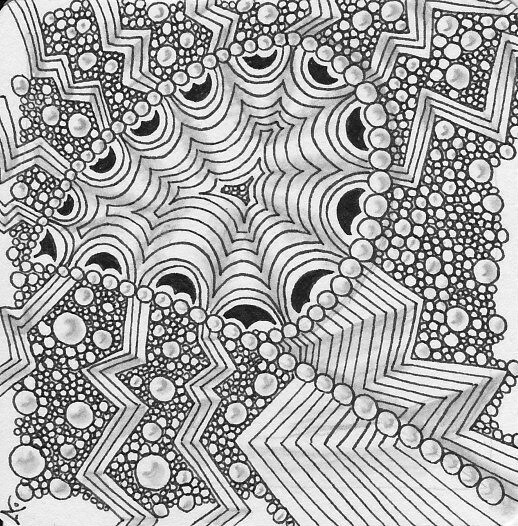 That’s why I want to try to incorporate the technique of tangle transitions into this project and learn more about it. I didn’t have much choice for the tangles of this first tile, but with the next ones coming up I’m sure I’ll have more chances to explore them. Here I like the transition between Crescent Moon and Static. Although now that it’s finished the border I made with Tipple is a little disturbing, I still like the tile! * This is no cooperation with anybody, I haven’t been paid or asked to do this and the book I use was bought by me. This morning I redid the design of this blog. Before, it was just a standard Quintus theme, but since autumn just started, I thought it was appropriate for the blog to adapt to the season, too. I changed the theme (Colinear now) because in the old theme the title of the blog was positioned inside the header design and was pretty much not readable anymore. I also changed the colours to a more autumnal look and – maybe the most noticeable change next to the colours: I drew a header design. Since I want to change it with the seasons, I’ll post it here, too, so it shall not be forgotten even when the next season comes. The header design was done on The Langton 300g/m2 smooth watercolour paper. I first painted the background with watercolour and and tangled away after it had dried. Last but not least, I added some shading in coloured pencil plus a few accents in golden gel pen. I chose the tangles because they somehow made me think of autumn. They are: Ansu, Bulb Lantern, Cruffle, Minline, Oke, Pixioze and Zinger. I hope you like it! Let me hear what you think.